First off is Yeah! 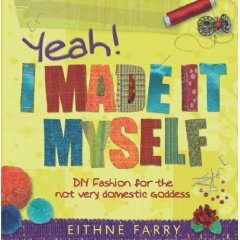 I Made It Myself , by Eithne Farry, which has been languishing under a pile of language-related books I have to review for I don't know how long. Since I came back from London, at the very least. Which is a shame, because it's a charming book. I fell into immediate sympathy with the author, who declares (in the first fifty pages) her love for bias tape, sewing with furnishing fabric, and bright colo[u]rs. But, be aware this is much more of a punk-rock, you-go-girlfriend-type book than a Martha Stewart "here are my 105 downloadable templates" type book. Most of the measurements given are approximate; the "diagrams" are done in what looks like magic marker. If you need constant reassurance that you are "doing it right", this is not the book for you; if you want to feel as if any way you do it is right (within reason), jump right in. This book would be a perfect present for a teen friend who wants to sew but is put off by the embellished-quilted-vest crowd you see on a lot "traditional" sewing books … just keep an eye on your curtains. The other book that's up for review today is 99 Ways To Cut, Sew, Tie & Rock Your Scarf I was really looking forward to this one, because I'm always interested in ways to make clothing-type stuff from things that aren't necessarily fabric (although of course with scarves it's changing one clothing-type thing into another clothing-type thing, or, in this case, 99 other clothing-type things). However, if you are a halter-top fan, and you have been looking for a good quick balloon-skirt pattern, this book is totally for you. The instructions are clear and easy to follow and there's a great glossary of terms at the end. And even if you don't want 47 scarf-based tops that you can't wear a bra under, the "Jolene" kimono-style jacket is really lovely. 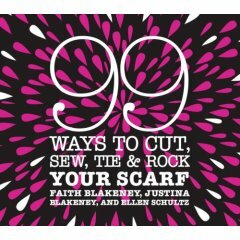 Again, though, this is a sewing book for non-sewers: almost every project can be made without a machine, and the emphasis is heavily on "find the scarf (preferably in a thrift store) today, wear it out tonight." I had just enough for a skirt … I thought. Then I saw that I'd dropped the center-back pattern piece on the floor. D'oh! So help me out, and get a free book! Email or comments are both fine ways to enter. If you leave a comment, though, make sure I can reach you to get an address for the sending of your prize! Is it time to post about shoes again? 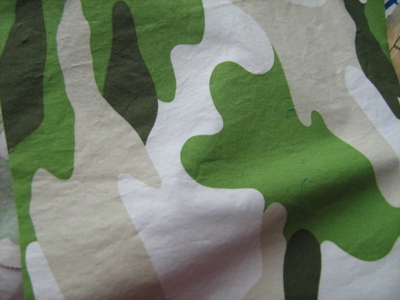 Wow, I found dozens of camouflage fabric — specifically cotton twill — on various websites, but none that are exactly like the one you depict. Who knew camo was such a popular print?! I’ve seen a camo print exactly like that only occasionally at JoAnns here in Lakewood Co…but only once in a while. I have a question that’s tangentially inspired by your request for fabric. Does fabric have dye-lots like yarn does? Can you just…buy more of a particular print, a year later (if it’s still in print), and have it match? Does fabric work that way? Ugh, it’s really hard to determine if the colors are quite right, but here is one link:http://stores.warehouseoffabrics.com/-strse-Camouflage/Categories.bokand this one:http://www.fashionfabricsclub.com/catalog_items.aspx?TypID=124&Viewby=Types&Page=1Good luck. And even if you don’t want 47 scarf-based tops that you can’t wear a bra under, the “Jolene” kimono-style jacket is really lovely. Yeh, I can go braless, but…..Thanks for the review of diy sewing books…..(isn’t all home-sewing diy??) duh. And I like camo also, tho I prefer the military stuff….but I live in Pierce County with bases bases bases……so I’m no help, and therefore, not a winner! Spooky you should mention halternecks – was just looking at buying a pattern for one today; those of us with broad shoulders and nothing much to speak of in the frontage department rely heavily on them to make us look sporty and athletic in summertime instead of just, well, lacking. But I’m more than sure I wouldn’t be able to carry off the relentlessly youthful cast of 99 ways. Thanks for those useful reviews – did enjoy them. Please be sure to do more! But more importantly than the content…how on earth do you pronounce the first author’s name? I have the “prequel,” 99 Ways to Cut Sew and sdhfdjskh Your T-shirt. It’s a lot of backless styles (plus one weird low crotch harem pants style), but pretty inspirational. I’ll give the scarf book a quick look. …none of the illustrated models are wearing eyeglasses!Another tangent: do you have any advice on how to respond to well-meaning family, friends, colleagues and strangers who suggest you try contact lenses? I just like wearing my glasses. I’ve got ‘Yeah I Made it myself’ and it does encourage you to go and make something, but I do need another reference book to tell me how to hem and neaten edges nicely. I much prefer another book which Erin reviewed on here a while ago – Sew What Skirts. I have ‘Yeah I Made It Myself’ and do like it – but it appeals to my intrisically slapdash ways. Also, the author is an Irish girl in London, like my good self. Her name, Eithne, is pronounced “eth-na”. It’s one of my favourite names!